This new book "3-D Conformal and Intensity Modulated Radiation Therapy: Physics & Clinical Applications" in radiation therapy provides a comprehensive overview on the physics & clinical applications of 3- D CRT and IMRT. It covers full range of detailed topics and cutting edge information on recent clinical application of 3-D CRT and IMRT treatment planning. 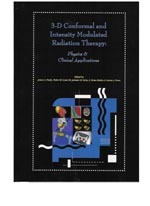 This book presents the physics and clinical information you need to implement and practice 3-D conformal and intensity modulated radiation therapy techniques and their applications in your radiation oncology center. It includes step-by-step descriptions of methods necessary for practicing full 3-D CRT and IMRT using precise imaging techniques for tumor localization, targeting, and treatment planning. This book on 3-D CRT and IMRT describes clinical and biological plan evaluation and various imaging methods in the technical implementation and the clinical aspects of 3-D CRT and IMRT treatment planning. IMRT treatment planning 3-D RTP plan evaluation Biological indices in plan evaluation , TCP & NTCP calculation . Image segmentation and volume display for 3-D RTTP CT-Simulation and 3-D planning process , Image fusion for 3- D CRT . Imaging in IMRT, Geometric uncertainty in 3- D CRT, Patient immobilization for 3-D RTP & virtual simulation . The convolution algorithm in IMRT, A non-convolution dose model for high energy photon beams. Monte carlo dose calculation for 3-D RTP Commissioning of photon dose calculation algorithms for 3-D RTP system, Computer optimization and objective functions , Corvus optimization algorithm in IMRT , Helios optimization algorithm and IMRT planning , Commissioning and QA of the Peacock, Elekta, Varian, and Siemens IMRT system , Patient specific IMRT QA ,Beam calibration using standards of absorbed dose in water , Clinical implementation of electronic portal imaging ,Radiation oncology medical information systems & PACS , Advanced topics in IMRT , Helical tomotherapy, MLC as a field shaper. Clinical: Prostate 3- D CRT, Mallinckrodt, M.D. Anderson, and Fox Chase cancer center experience, 3-D CRT & IMRT, UCSF and Memorial Sloan-kettering Experience , Prostate IMRT: Baylor University & New-England medical center , Head and Neck IMRT, Washington University, New-England medical center, Stanford University, and Baylor University experience, 3-D CRT RTOG 94-06 update Clinical dose- volume endpoints for Pneumonitis and Esophagitis, Pediatric & selected CNS IMRT ,QA for 3-D CRT/IMRT multi-institutional clinical trials. Cost benefit of 3-D CRT/IMRT Clinical data analysis of NCTP modeling for normal lung & tumors. This is an invaluable and essential reference for radiation oncologists, medical physicists, dosimetrists, treatment planning system developers, and other professionals who need in-depth information about the physics and clinical implementation and practice of 3-D conformal and intensity modulated radiation therapy.